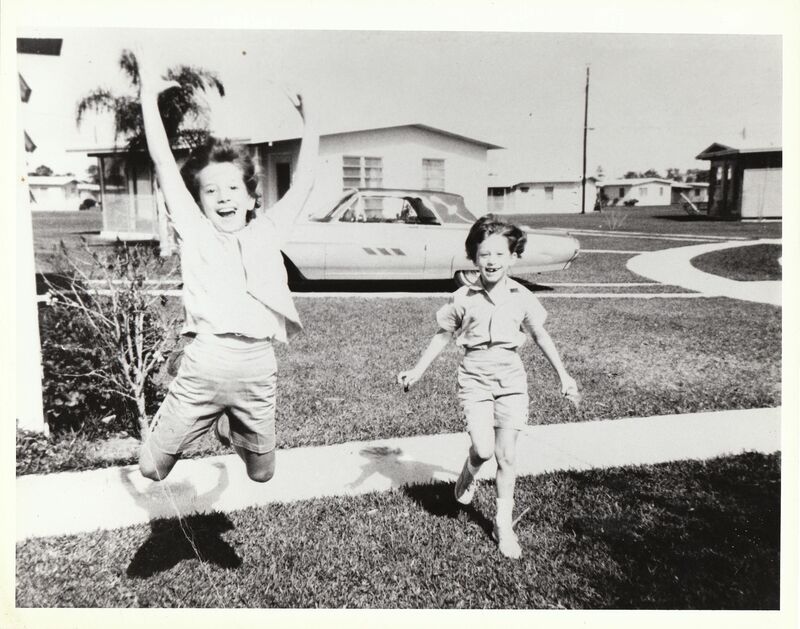 Me and my sister Liti in Hollywood, Florida: great oranges, great spirit, great cars. I just came back from Royal Palm Beach, Florida, where I went to see my mother. I’m not sure I’d say it was a vacation, exactly. More of a visit with some good and some rough moments. The weather, except for two days, was cold. It has been that way for a good part of the winter, destroying much of the orange and strawberry crops. I did find oranges, but not the abundant, fragrant loads of them you usually see piled up at every fruit stand and sold from the backs of trucks along the highways. When I was a kid we had a house in Hollywood, Florida, which my parents and sister and brother and I shared during winter months with my grandparents, two sets of aunts and uncles, and about nine cousins. It’s hard to imagine how we all lived together in that tiny place, especially as it had only four bedrooms. Things could be hectic, but oddly enough we mostly had a ball, at least the kids did. Now that I’m an adult myself, I couldn’t stand being jammed into that tiny place with three generations of Italian-Americans and only one blender for making whiskey sours. We once went to pick up a hamburger order from Royal Castle (Florida’s version of White Castle), and the checkout guy asked my father if he was picking up for the local military academy. He was serious. We made a lot of fresh fruit drinks from the output of the astonishing array of trees in our little backyard. We had excellent grapefruits, mini bananas, aloes (not a fruit, certainly, and probably not truly edible, but great for sunburns; edible fruit or not, my grandfather mixed some of its slimy insides into grapefruit juice as a hangover cure), limes (not the key variety, unfortunately), coconuts, papayas, and two different types of oranges, one tree producing typical, round, orange ones like you’d buy in a grocery store, the other heavy with medium-size, yellowish fruit with thin but almost leathery skin, usually streaked with brown. When you cut into the yellowish ones, their flesh was brilliant orange, almost electric in contrast to the skin. My uncle called them Hamlins, but they weren’t Hamlins. Hamlins are bright orange. They were Florida street oranges. Nobody knew what they were. I hadn’t seen those oranges since the 1970s, but last week there they were, all over the sidewalks in Royal Palm, blown off the trees by the high winds. I think they were the only oranges that were hardy enough to make it through the bad winter in any quantity. They were good, too. You could buy eight for a dollar at a nearby Cuban fruit stand, but why bother when you also could just gather them along the street? Since I’ve been on my mission to rethink Sicilian cooking, all these oranges lying around got me thinking about the many Sicilian dishes that include orange, some in very strange arrangements, like Insalata di Arance e Aringhe, a salad made with oranges, smoked herring, and sometimes fennel. Here’s a recipe for that from an older post of mine. I originally thought I’d get back to New York and make a version of that with grilled sardines instead of canned herrings, but I couldn’t find really fresh sardines (it’s hit-or-miss around here with those little fish). So I settled on good-quality salt-packed anchovies (I used Flott, a Sicilian brand). So here’s another nuovo Siciliano concoction that to my palate comes out just fine. The soy sauce would not be recognizable to many Sicilians, unless they lived in Palermo and frequented Japanese restaurants (there are a few), but other than that it’s just a rearrangement of familiar Sicilian flavors (endive is not Sicilian, but it is a fancier equivalent to all the bitter chicories that Southern Italians love so much). This salad went very well with the pan-seared pork chop with capers I served alongside it. I can imagine it going very nicely with a roast chicken too. In a small bowl, mix together all the ingredients for the vinaigrette. Add more soy or lemon juice if needed. 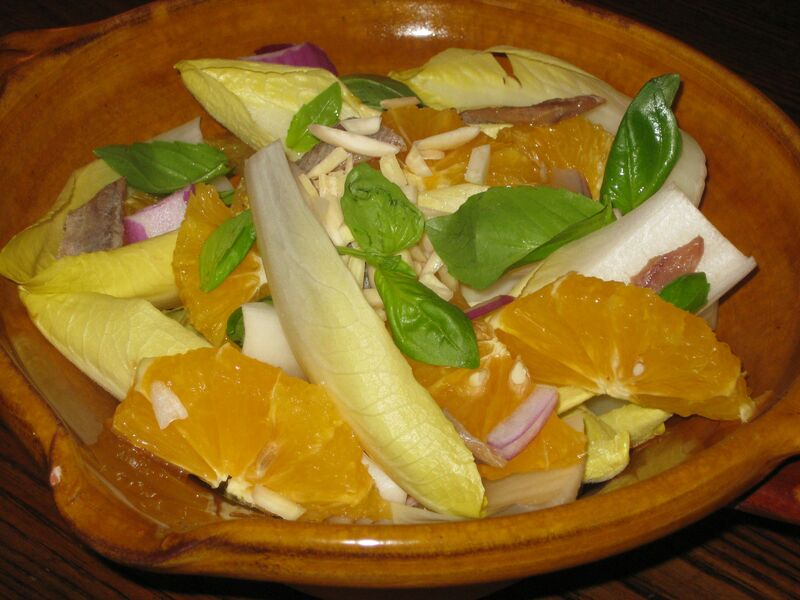 In a salad bowl built for two, combine the endive, orange sections, red onion, and anchovies. Add a few grindings of black pepper. Pour the dressing over the salad, and toss gently. Scatter on the basil leaves and the almonds. Serve right away. this recipe sounds so easy and delicious, i printed it and will do as soon as i find some nice oranges, around here. name of oranges that i can find in ny? agreed with substituting the cilantro. did you try to add some drops of colatura, instead of soy sauce? latter does not sound very sicilian, either. You could substitute colatura for the anchovies. In fact colatura, soy sauce, olive oil, and lemon juice make a great dressing for punterelle.